In that work first of all I draw different poises of my self on to the wall. 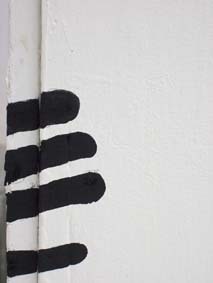 I leant against the wall and drew all of my body from where I stood from top of my head and I painted with black. I was drawing them as though a child play hide and seek. Some of them they were hiding, some of them we can see their body marked in the space. One of the figures by the entrance is offering to audience Turkish delight , second figure by the corner ( hands up ) it is kind of represent here I am, of another figure we can just see the fingers. 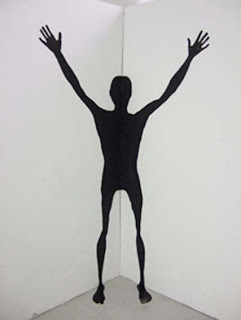 I started to paint them and they started to became like shadow, like skin of the body and hologram bodies at the space. As I looked at them they appear more like alien bodies, and there is not specific gender or sexuality. it is a play between kids games and cultural, and social references.